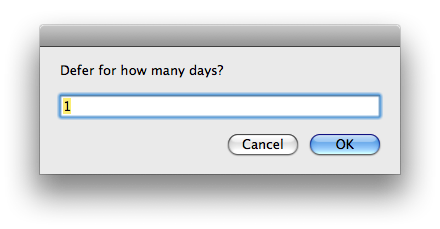 Enter the number of days to defer the items in the resulting dialog box and select “OK” (default is 1, so feel free to just hit Return to ‘snooze for a day’). The script will then prompt you whether to defer both start and end dates of the items. “Due [date] only” is the default option, so again, feel free to hit return to snooze your due date only. 19 Feb 2009: version 0.2 is now available. Release notes here. Download link is for current version. This is terrific. Thanks for sharing it. Fantastic! I have been looking into something like this for a long time, having requested it from the Omni people as a toolbar option. Well here it is! However I am getting an error wnen selecting several actions and trying to snooze one day. AppleScript reported the following error: OmniFocus got an error: Can’t get tree 15 of tree 1 of content of document window id 448 of document id “oeJ-vPFksgV”. Invalid index. Manuel—glad you enjoy the script! And I’m sorry for my delayed response. I’ve encountered the same issue and haven’t had any success debugging. I may contact OmniGroup for support. Just a heads up that this script did some light damage to my due dates, nothing serious but not exactly harmless either. I selected several items, deferred them en mass for 1 day, some worked but most did not and I got the error noted by Manuel. I continued selecting and attempting to defer, getting a couple more to defer each time. But after a few iterations, I realized that the script was somehow still acting on previously deferred items, resulting in a real mess of incorrect start and due dates. Arg. This script is most definitely not rock solid. It’s been working fine for me on one or two deferrals at a time, but it really choked on multiple items. Thanks, this a very useful script! Is there any way I could adjust the script to defer only start dates? I realize “snooze” offers something like that, but I would like to be able to batch defer the start dates of a bunch of items with different start dates. I’ve added a hidden option for you in the latest version. You’ll need to change the settings just a bit; open the script and set “promptForChangeScope” to “false” and “changeScope” to “Start Only”. You can find these settings below the description area of the script. Hi Dan – great script! @Dave – you just need to change the icon of the script file itself. 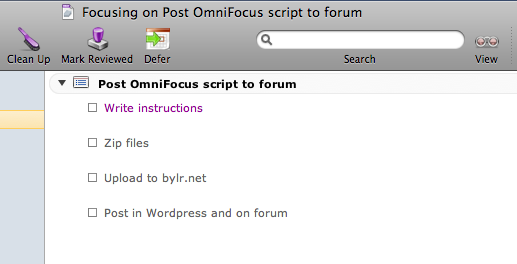 This looks great, thanks for scripting it up, documenting and offering it! I have a different use case: I frequently find myself needing to “defer” a bunch of actions by 30 minutes or an hour (when I get a “drop everything” task I didn’t plan on or when I’m running behind). Is there an easy way to change this script from “days” to “minutes”… I can probably dig into the guts but it would be awesome to have a default “defer unit” being days, hours, minutes. Thanks again! Joe – see my email to you with a change that should give you more flexibility. Once I test it for a few days I’ll post it online as well.